This spicy sausage stuffed bell pepper dish was inspired by a recipe I found in an old coffee table top recipe book: Outdoor Entertaining, Cold Street Press 1991. I couldn't find a copy of the book on the internet so I'm not sure if it is still in print. Starting with the freshest main ingredients are a motley of bell pepper colors in orange, yellow, and red (of course you can use green! ; bulgar wheat; an onion; and Italian parsley. The flavor and aroma of Italian is wonderfully more than intense than regular parsley. Now just how colorful is this! Turn on a bossa nova song, add a bottle of wine and have fun stuffing these babies! I altered the recipe for a simpler taste; however, I do note the original recipe ingredients in italics for those who would like to try that. Melt butter in a frying pan and add onions and garlic. Fry gently until onions are translucent. Push it to the side of the skillet. Add sausage meet and fry gently for 5 minutes. You will need to continue to break up the sausage meat. Once it is completely cooked, mix in the onion and garlic. In a bowl, mix together Bulgur and parsley. Season with salt and pepper to your taste. If you choose to add the cherry tomatoes, add them to the Bulgar and parsley mix at this step. Halve the peppers and discard seeds. (I like to leave the stem on, having cut it into a half size as well. It's really more for garnish.) Fill the peppers with stuffing and place in a shallow baking dish. IF needed, drizzle olive oil over the stuffing and peppers with olive oil. Bake for 30 minutes. If you like the top slightly crunchy, add about 10 minutes more, as I did here. *Notes: If you are unable to find a spicy sausage or if you simply like more heat, add 1/4 to 1/2 tsp of dried red pepper flakes. Another option is to add one small jalapeno pepper fine chopped. Also, be sure to check your oven temperature. 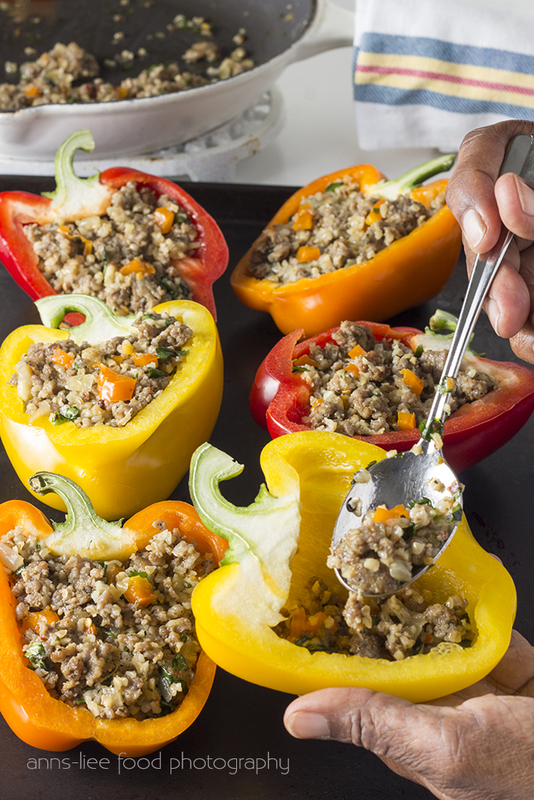 If it cooks too hot, you'll have mushy bell peppers! How to cook Bulgur wheat: Add 1 part Bulgur wheat to a bowl. Pour in 2 parts boiling water over the wheat. Let it stand for 15-20 minutes. In case you are asking what is Bulgur wheat: "It is a cereal food made from groats of several different wheat species, most often from durum wheat. Burghul is a kind of dried cracked wheat. It is most common in European, Middle Eastern and Indian cuisine." Wikipedia. If you have had tabbouleh, you have most likely had it with Bulgur wheat.